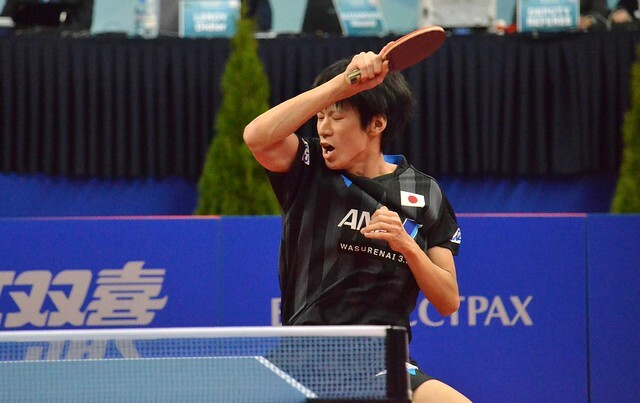 The penultimate day of the 2018 ITTF Challenge Belgosstrakh Belarus Open produced plenty of surprises to digest including an unexpected elimination for a top seeded player and impressive showings from two young Chinese stars on Saturday 17th November. Canada’s Zhang Mo and Japan’s Miyu Kato, seeded first and fourth respectively, were the major casualties of the last 16 of the Women’s Singles draw, experiencing shock defeats at the hands of Russian qualifier Maria Dolgikh (5-11, 11-9, 11-6, 11-7, 11-6) and fellow colleague Sakura Mori (11-9, 11-5, 8-11, 6-11, 7-11, 11-7, 12-10) to bring their their title aspirations to an end. There was no such trouble for no.5 seed Minami Ando who, following her 4-1 win against Hana Matelova (11-8, 11-8, 6-11, 11-3, 11-5), went on to seal her spot in the semi-finals at the expense of third seed Chen Szu-Yu (11-8, 11-7, 11-8, 1-11, 4-11, 13-11). Second seed Saki Shibata was pushed hard in her first fixture of the day, recovering from a 1-2 deficit to see off no.9 seed Ganna Gaponova 4-2 (11-8, 8-11, 8-11, 11-4, 11-3, 11-5) before posting a 4-0 victory over no.11 Barbora Balazova (11-9, 11-2, 11-8, 11-6) to progress to the penultimate round. Miyuu Kihara, seeded 15th, is also through to the last four after bringing Maria Dolgikh’s inspirational campaign to a close in the quarter-finals (11-9, 11-9, 11-4, 11-6) but it was the reverse outcome in the other encounter between Japan and Russia as Sakura Mori exited to Polina Mikhailova in straight games (11-7, 11-4, 11-7, 11-7). If there was one player who stole the show in the Men’s Singles draw on Day Three it was surely Romania’s Cristian Pletea: the no.23 seed opened his account with an astonishing performance against third seed Nima Alamian (11-1, 11-7, 11-9, 11-7) before going on to break the hearts of the home fans by knocking no.14 seed Pavel Platonov out of the competition at the quarter-finals stage (10-12, 12-10, 11-7, 11-6, 11-6). Disappointment for Pavel Platonov, one round earlier Aliaksandr Khanin had bid his farewells with a 4-1 defeat to Chinese qualifier Zhao Zihao (11-4, 14-12, 11-5, 6-11, 11-6) as the host nation’s dreams of lifting the trophy faded away. Zhao Zihao put in another superb display later in the day against Kakeru Sone (11-4, 11-7, 11-3, 11-8) to earn his place in the semi-finals where he will meet no.4 seed Lubomir Pistej, who also enjoyed a successful day in Minsk with victories over Antoine Hachard and Harmeet Desai. Shunsuke Togami is the other player through to the last four with the Japanese teenager negotiating his fixtures against Sweden’s Elias Ranefur and Simon Arvidsson. The first gold medals were awarded to players representing China with He Aige and Zhao Zihao emerging victorious in the Under 21 Women’s Singles and Under 21 Men’s Singles events for the first time. Making her international debut in Minsk, He Aige came out on top in a tight five games contest against Japan’s Miku Izumo (11-9, 9-11, 8-11, 11-6, 11-4) while Zhao Zihao needed just the three games to see off Russian opponent Denis Ivonin at the final hurdle (11-8, 11-8, 11-3).